Eggs contain a wide range of vitamins and minerals, as well as beneficial protein and fat for energy. Though their cholesterol level might have negative health effects for some people, eggs are healthy when consumed in moderation. Use them as a base for healthful dishes, such as crustless quiches, vegetable omelets and poached eggs on whole-grain toast. Vitamin B-12 is found in eggs. This water-soluble vitamin is stored in the liver. Vitamin B-12 works to create red blood cells. It also regulates your metabolism and supports the health of your central nervous system, while low vitamin B-12 levels can cause irreparable nerve damage. Each egg provides you with 0.45 micrograms of vitamin B-12, or 19 percent of your recommended daily intake. Eggs are a good dietary source for vitamin A. The fat-soluble vitamin helps keep vision strong. It also helps cells grow and maintains skin health. 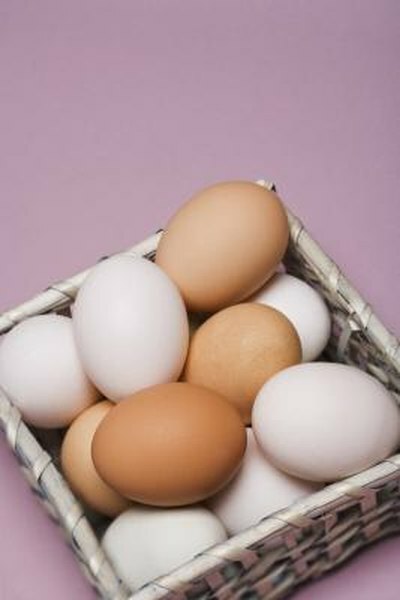 Eggs also contribute vitamin B-6 to your diet. This vitamin is water-soluble. Thus, to maintain this vitamin in your body, it is crucial to regularly eat foods that contain vitamin B-6. This vitamin creates antibodies that help prevent diseases, notes MedlinePlus. Vitamin B-6 also helps your body create red blood cells. Each egg contains 270 international units of vitamin A -- 12 percent of the recommended daily intake for women -- and 6 percent of your daily B-6 requirements. Vitamin D is contained in the yolks of eggs. This vitamin works with calcium to help your body have strong bones and to prevent osteoporosis. This vitamin also helps keep your immune system strong to prevent diseases and to keep muscles functioning optimally. Each large egg contains 41 international units of vitamin D, which is located in the egg yolk. This provides 7 percent of your recommended daily intake. Eggs also contain selenium and iron, two essential minerals. Selenium works to prevent cell damage. It also impedes the buildup of toxic heavy metals in your body, notes MedlinePlus, and also plays a role in thyroid function. Iron helps you make red blood cells and aids in energy production. Each large egg contains 0.9 milligram of iron -- 5 percent of the recommended daily intake for pre-menopausal women and 11 percent for post-menopausal women -- and 20 percent of your daily selenium requirement.